Today is unofficial Dave Witte day at the Cerebral Metalhead compound. At my day job, I suggested Municipal Waste to a music supervisor looking for local music talent for an upcoming TV drama set in Richmond, VA. Then I got a call from Jon Chang of Discordance Axis/Hayaino Daisuki/Gridlink, who was apparently referred to me by Mr. Witte himself. And now I'm gonna drop some pseudo-science on the debut album by Hex Machine, whose gristly grooves were once bashed by the Wittester, before his drinking duties with Municipal Waste become too involved for him to continue playing with every band on the planet. Hex Machine - "Black Skeleton"
Let not the departure of this band's sorta famous drummer deter you -- Hex Machine brutalize as is. 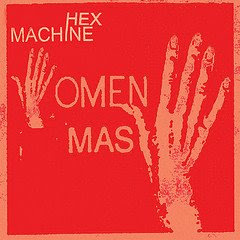 Omen Mas timewarps to an era when grunge and metal were still lounging around in bed post-coitus, the early-90s heyday of Melvins and Today Is the Day and Cows, when Amphetamine Reptile could do no wrong and production clarity was for assholes. Every deranged riff is dipped in electric tempura batter and fried 'til crispy, every one of Trevor T's honest-to-Satan melodies is corroded in feedback. Heavier tracks like "Nurse Me Back to Hell" and "Godheads Full of Candy" crawl in the dirt and puke up mud. The more rockin' numbers drag the filth out into the light -- Hex Machine sound like elephants in tutus on "Black Skeleton" and "Vivisection," their bulging, gritty guitar tone stuffed into awfully well-formed songs. Hex Machine - "Hook And Eyes"
Very cool stuff. It's good to see some Melvins influence, something different for these days. LOTS of attitude in Hook and Eyes.